This post features three snap previews for 4th round matches from the top half of the women’s draw including Caroline Wozniacki vs. CoCo Vandeweghe, Svetlana Kuznetsova vs. Agnieszka Radwanska and Magdalena Rybarikova vs. Petra Martic. For a full match preview of Angelique Kerber vs. Garbiñe Muguruza, click HERE. Previews for the 4th round matches from the bottom half of the draw are also up on Moo’s Tennis Blog! Caroline Wozniacki will be bidding to reach the quarter-finals of Wimbledon for the first time in her career when she takes on the number 24 seed, CoCo Vandeweghe on Monday. Wozniacki is 0-5 in Wimbledon 4th round matches and faces another big hitter in her pursuit of the clean sweep of quarter-finals at the Slams. Wozniacki had a narrow escape on Saturday, fighting back to beat Anett Kontaveit in three sets, 3-6 7-6(3) 6-2. Kontaveit twice served for the match at *5-4 and *6-5 in the second set. Kontaveit’s huge groundstroke game had put Wozniacki on the defensive and she pounded the Wozniacki second serve. Kontaveit had a break point for a double break in the second set but Wozniacki hung in there. Kontaveit clearly tightened up when serving for the match and was not able to swing as freely as Wozniacki came darting back into contention. Wozniacki was rock solid in the decider as Kontaveit increasingly struggled to find the court, hitting 11 winners to 20 unforced errors. A classic Caro comeback! Vandeweghe reached the last 16 with another straight sets win, 6-2 6-4 win over Alison Riske. The 25-year-old was cruising at 6-2 4-0 and had break points to go within one game of the win. 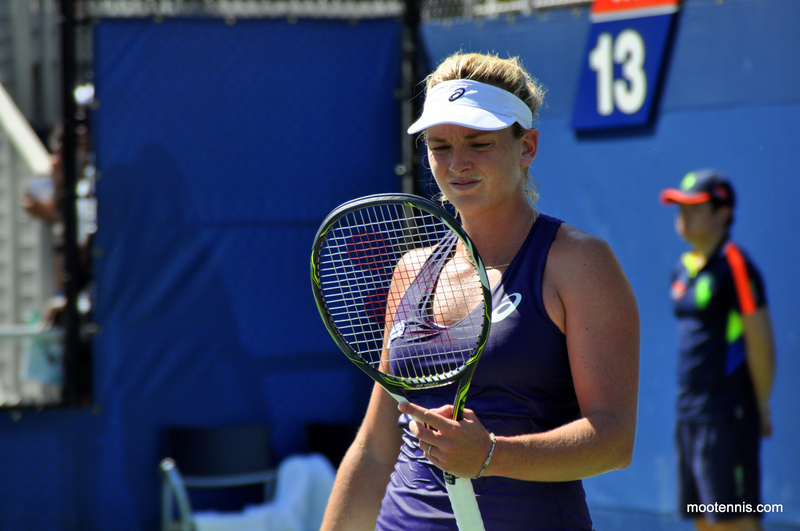 Riske though mounted a comeback as Vandeweghe’s focus snapped. As disappointing as the dip was, it was equally impressive that Vandeweghe managed to settle again from 4-4 to win the last two games. Vandeweghe’s first serve remains a huge weapon and she has won 73 out of 83 points behind it during these Championships. Wozniacki leads Vandeweghe, 2-0 in their head-to-head and won their last match in Beijing, 6-1 2-6 6-4. Vandeweghe’s aggressive game is well suited to grass and in that sense, it’s a similar match-up to Kontaveit. The American’s serve is even more potent, as is her ability to close points up at the net. The key factor may be Vandeweghe’s consistency and focus, which can go off at any time. I’d take a good performance from Vandeweghe to win this but if she wobbles, Wozniacki will sweep up. For the 18th time and second time on grass, Svetlana Kuznetsova and Agnieszka Radwanska will square off with a place in the quarter-finals of Wimbledon up for grabs. 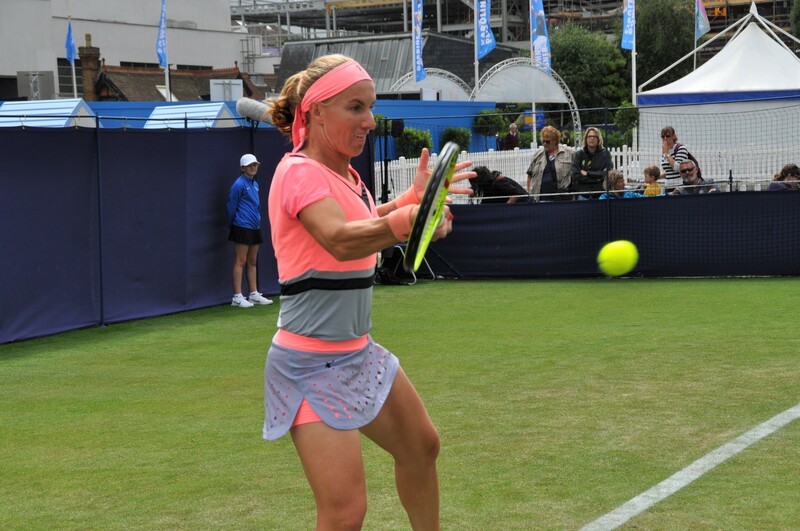 Kuznetsova has yet to drop a set this tournament and has navigated her way through a tricky draw – Ons Jabeur was a potentially lethal first rounder opponent, as was Ekaterina Makarova on grass in the second round although that has always been a favourable match-up for Kuznetsova. In the third round, Kuznetsova won the last nine games to beat the qualifer, Polona Hercog, 6-4 6-0. Radwanska is enjoying her best run of the year, winning three matches at the same tournament for the first time since Sydney in January. The number nine seed had battled health issues during the start of the grass court season. She’s had it tough through her three rounds but each win has added another ratchet to her bar of confidence. Most significantly, Radwanska saved two match points to beat Christina McHale in the second round and then came from a set down to beat Timea Bacsinszky in the third round, 3-6 6-4 6-1. Increasingly targeting the Bacsinszky forehand and playing more aggressively, winning 26 of 35 points up at the net, Radwanska wore down a fading, Bacsinszky. Kuznetsova leads Radwanska, 13-4 in their head-to-head, and has won their last three matches. The last two encounters were absolute epics with Kuznetsova prevailing, 7-5 1-6 7-5 at the WTA Finals last year. They are tied at 1-1 on the grass with their most recent match on this surface at Wimbledon, also at the last 16 stage in 2008 (! ), 6-4 1-6 7-5. Radwanska’s game matches up beautifully on the grass, yet Kuznetsova is so versatile. I feel like Kuznetsova *should* win this match, however Sveta is Sveta, and i’m impressed with how well Radwanska has fought this week. In the only all-unseeded match-up from the slate of 4th round matches, Magdalena Rybarikova will play Petra Martic. While both unseeded, they have truly EARNT their places in the last 16 with a series of stunning wins. Rybarikova arrived at Wimbledon in great grass-court form, having won two $100k ITF titles in Surbiton and Ilkley, and also reaching the semi-finals of the WTA International tournament in Nottingham. The pinnacle of Rybarikova’s Wimbledon run so far was a stunning 3-6 7-5 6-2 upset of the number three seed and title favourite, Karolina Pliskova. Just as impressive, Rybarikova backed up the Pliskova win with a routine 6-2 6-1 win over Lesia Tsurenko to reach the last 16 of a Slam for the first time in her career. Martic has reached the last 16 at the French Open and Wimbledon, both times as a qualifier! Martic’s big win came in the first round when she defeated the number 20 seed, Daria Gavrilova, 6-4 2-6 10-8. Saving three set points in the first set of her third rounder against Zarina Diyas, Martic strolled through the second set to post a 7-6(6) 6-1 victory and reach the last 16 of Wimbledon for the first time in her career. Rybarikova and Martic have combined this year for a whopping 60 match wins. Both made their comebacks to the tour following lengthy spells away from the tour – Rybarikova had surgery on her wrist and knee last year and missed eight months, while Martic was sidelined for 10 months with a back injury. Their comebacks have been wonderful storylines to witness. A part of me is disappointed that this match may get overlooked out on Court 18 with so many women’s matches up first. Sadly that is the nature of Manic Monday. Kuznetsova and Radwanska are 1-1 on grass. Sveta beat Aga at Wimbledon in 2007 (I think). I may be wrong but I think both their previous meetings were in the 4th round too! Spot on, missed that one which was actually their first ever meeting on tour! Sveta won in straights in the 3rd round. Before my time of following the WTA closely! I was too young to remember their 2008 match but at one point it was uploaded on youtube and it was SUCH an entertaining affair. Kuznetsova had a 41 lead in the third set and then had break points to go 53, but Aga managed to pull the upset. Of course, these days it would probably be Kuznetsova who would be the ‘underdog’- at the time, Kuznetsova had made 3 QFs in 5 years and was one of the favorites to go on and win. Going with the same winners. I don’t know why but I don’t think Caro will stand a chance against Coco. that’s a bit harsh but Coco definitely has upped her game when playing good / Top-10 opponents. Yeah I just think Coco is a far better player on grass than Caroline is. I did think she’d go deep last year and she faltered though, so I wouldn’t be at all surprised if she pulled a shocker and Wozniacki took advantage as she usually does. There are very few players who I dislike on the WTA tour but Coco is one of them so I am hoping that Caroline will defeat her. Coco has a game suited to the grass though and if she gets her serve working properly then she will be hard to defeat. Head says Coco to win and heart wants a Caroline victory. Kuznetsova vs. Radwanska looks likely to be a close one and I’m going with Aga to edge it. I’ll be surprised if Magdalena Rybarikova does not beat Petra Martic. It is taking place on court 18 away from the limelight which may help Magdalena Rybarikova who is playing some great stuff on the grass this summer. I am just wondering if it is time for Radwanska to get a win over Kuznetsova. Last year, Aga couldn’t close out Sveta in those two encounters, at Wuhan and Singapore. I fell like Kuznetsova can bully her way to a win here (I know it’s easier said than done). And on current form, and seeding, one would expect it to be Kuznetsova. I am hoping for Radwanska to keep it going though. Coco definitely has the game to take out Wozniacki – but Caroline has competed really well this tournament. She looks to be up for it, but if Coco is on, it should be a routine straight sets encounter. Great to see Martic in another 4th round at a slam, just as it’s great to see Rybarikova playing well again. Mag has the better grass skills and looks to be the more flexible of the two, which should give her the win. The thing with Aga and Sveta is that it’s completely on the Russian’s racket. If she’s fired up and hitting the ball well, she can completely overpower Radwanska, whose strength of being able to outmaneuver her opponents is nullified against Kuznetsova. Svetlana is every bit as solid when it comes to cat and mouse points. However when Kuznetsova is NOT on, she tends to be very susceptible to hitting the wrong shot, and that’s something Aga will gladly encourage. So many of these matches I could honestly see either player prevailing, Aga vs. Sveta is one of those matches. Sticking with Sveta but coming more around for Aga! If I don’t run the table here, I’ll be looking to take out a lease on a luxury abode under the bridge. I want Caroline , Aga and Ostapenko to surprise me when the day is done.